October 3, 2004, Center for Arms Control, Energy and Environmental Studies at the Moscow Institute of Physics and Technology released English translation of the report on Non-Strategic Nuclear Weapons. Problems of Control and Reduction (PDF file, 0.5 Mb), by Anatoli Diakov, Eugene Miasnikov and Timur Kadyshev. The report is addressed to a broad audience - political scientists, military, technical and arms control experts, diplomats and general public, interested in problems of international security. To obtain paper copy of the report (in Russian only) please contact (+7 095) 408-6381 or via email. Non-Strategic Nuclear Weapons. 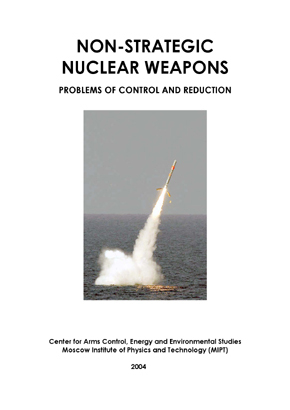 Problems of Control and Reduction, by Anatoli Diakov, Eugene Miasnikov and Timur Kadyshev - Center for Arms Control, Energy and Environmental Studies at Moscow Institute of Physics and Technology, Dolgoprudny, 64 pages. Full text of the report (PDF file, 0.5 Mb). The report analyzes place and role of Non-Strategic Nuclear Weapons (NSNW) in the Russia's, US and NATO nuclear doctrines, assessments of their NSNW arsenals are presented, their approaches towards problems of control and reductions of NWNS studied, possible approaches to solution of these problems suggested. The report includes Foreword by Dr. Alexei Arbatov, Introduction, five Chapters and Conclusions. The Introduction analyzes current state of affairs in the sphere of control and reduction of non-strategic nuclear weapons. Particularly, a conclusion is made that after 1987 INF Treaty and 1991 Presidential initiatives, no noticeable steps have been made. Chapter 1 is devoted to problems of classification of nuclear weapons. There is no common view among nuclear arms control experts on what is tactical (non-strategic) nuclear weapons. One of the reasons is that objectively, it is rather difficult to choose criteria that would help differentiate between strategic and non-strategic arms unambiguously. Other reasons that make classification difficult are also considered. Classification used in the report is based on provisions of the START-I treaty, and according to it strategic nuclear weapons are the US and Russia's ones that are covered by START-I limitations, including nuclear warheads attributed to them, while non-strategic nuclear weapons are US and Russia's ones that are not considered to be strategic. Chapter 2 analyzes place and role of NSNW in Russia's nuclear doctrine, gives assessments of Russian NSNW arsenal, briefly describes nuclear safeguard measures. Chapter 3 provides assessments of the US NSNW, analyzes place and role of NSNW in the present-day American nuclear policy, current status of the US non-strategic nuclear forces and planning issues; also considered are current US discussions that question the need to keep NSNW, as well as issues related to development of new non-strategic nuclear weapons. Chapter 4 analyzes NATO nuclear doctrine, provides assessments of NATO nuclear forces and of the US nuclear forces in Europe; considers legal aspects of its deployment and use. The Chapter also analyzes contradictions of the NATO nuclear strategy in view of its extension to the East and in connection with provisions of the nuclear Non-Proliferation treaty. Chapter 5 analyzes US and Russia's attitudes towards controllable reductions of NSNW, considers the reasons why progress in the sphere of control and reductions of NSNW would answer interests of all concerned; suggested are possible ways to solve this problem. Nuclear weapons are an important tool of foreign policy and will likely continue to be so during the coming decades. Arsenals of strategic and non-strategic nuclear weapons possessed by Russia and the United States are excessive for maintaining their military security levels. Deterrence capability, including that at a regional level, can be effectively achieved with a much smaller number of non-strategic nuclear warheads. The continued existence of Russian and US arsenals of non-strategic nuclear weapons that are not subject to formal arms control agreements has a negative effect on policy of non-proliferation of weapons of mass destruction. Transparent reduction of NSNW arsenals could be a step towards strengthening Russian and US leadership of efforts to reduce the threat of nuclear use. Russia cannot and should not reduce NSNWs entirely on a unilateral basis. Reductions in its stockpile should be linked with the solution of a number of issues, the principal one being withdrawal of US nuclear weapons from Europe, that would be a major step toward eliminating the Cold War nuclear confrontation in Europe and that would open a new page in relations between Russia and its NATO neighbors. In the near future there is little chance that a legally binding agreement will be concluded between Russia and the United States that results in the withdrawal of US nuclear weapons from Europe. However, this does not mean that Russia should take a passive position on this question. At the initial stage priority can be assigned to unilateral actions which, on the one hand, would not significantly reduce Russia's defense potential and, on the other hand, would really demonstrate Russia's interest in achieving progress in this area. Most desirable would be steps aimed at creating an atmosphere of openness and transparency; for instance, the announcement of the number of NSNW warheads destroyed and still subject to destruction under the 1991 PNI. Simultaneously, it seems expedient to turn down US assistance in improving the security systems of storage sites for nuclear warheads, their transportation and destruction. Given the improved condition of its state budget, Russia can and should independently solve the issues relevant to its own national security. It will be reasonable to continue the joint Russian-American science-and-technology program for the development of verification measures for nuclear warheads and their destruction, while simultaneously protecting sensitive information. This program could create the basis for a mechanism for control over the nuclear warheads remaining in the arsenal of each side when, in the future, the sides are prepared to exchange information about the number of nuclear warheads and their deployment sites.